Lockyer Bins does not hold a Licence to carry Regulated Waste with the Department of Environment and Heritage Protection (EHP). No regulated waste permitted eg:- asbestos fibro, tyres, dangerous goods (fuel, chemicals, oils). Keep all rubbish confined in bin, do not overload. Lockyer Bins will not be responsible for any damage to clients property if the bin is placed according to hirer’s instructions. Should the driver become bogged in an area declared safe by the hirer, the hirer shall pay all costs associated with the recovery of the vehicle and any cost associated with returning the property to prior condition. 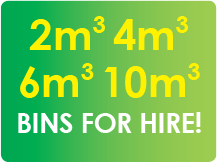 Any bin(s) damaged while on site will be repaired and costs forwarded to the hirer. If bin is shifted from delivery position, no responsibility will be accepted for removal eg too close to buildings or on driveways. If bin is shifted from delivery position it is the hirer’s responsibility to return bin to the original delivery site in preparation for collection. 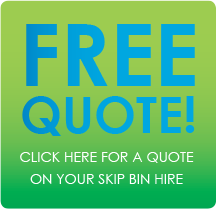 If you have any questions about your skip bin hire, please phone 5426 1256.